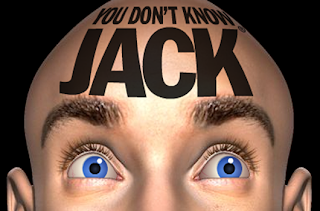 You Don't Know Jack is definitely one of the best video game series you've never played. It's one of those that has a bit of a cult following, yet anytime I introduce it to people, the reception is always a positive one. Now they've finally released it to consoles! I'll be anxious to see the sales figures for it, but sadly this does not entirely live up to the glory of its predecessors. It still does an excellent job and is certainly worth the $30 price tag. Yes, a new disc game at half the price you'd normally expect!